Well, the short answer is, yes. Tulips are poisonous to chickens, as well as to most other animals, including people. Generally, this isn’t a problem, though. 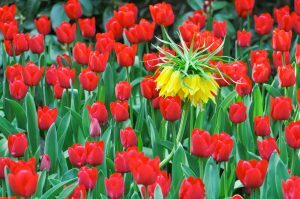 There are a few reasons why it shouldn’t worry you too much to have all the tulips, daffodils, and other flowering plants you want, even when they aren’t necessarily friendly to chickens. Are my chickens likely to eat them? Does it look like the kind of thing they eat? Am I likely to tease the chicken with the plant or to otherwise make it seem OK to eat? Are any of my other animals prone to eating plants that look like that? These three questions not only tell you that tulips are not at high-risk for chicken grazing, they also provide a guide you can use when deciding whether other potentially toxic plants are going to cause a problem. Chickens are naturally foraging animals, which means they have the instincts to check out new plants by taste-testing very small amounts before deciding whether or not to eat more. They are pretty good at figuring things out for themselves, too. Even if there is a little nibbling here and there, it is highly unlikely that a chicken will decide to eat enough tulip to cause serious problems. Human behavior does have a large impact on animal behavior, though. If you give your chickens food, they tend not to question it, and that plays a role in the other foods and plants they will deem safe. If you feed your chickens anything that looks like tulips, then it might be a good idea to steer clear of having tulips in your yard. Otherwise, are tulips poisonous to chickens? Yes, but it isn’t a big problem.